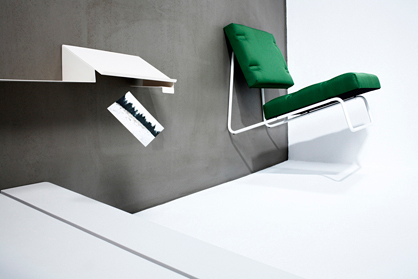 A few separate furniture parts, the half done prototype of a reception chair in the middle of the room – the studio of the furniture designer Eric Degenhardt from Cologne seems like a well sorted working space, a room filled with concentration. 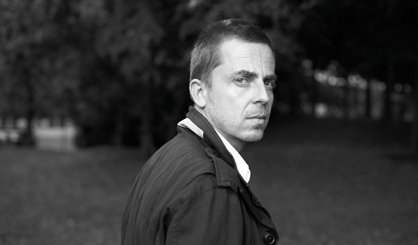 Born in Cologne in 1968, he studied architecture at the Technische Hochschule Aachen and worked for several years as an architect, before he started designing furniture. Meanwhile he works for premium manufacturers like Wilkhahn and Richard Lampert. His reserved, yet very likeable ways are reflected in his elegant designs and we had an enjoyable conversation where I got a glimpse behind the scenes of a small but successful design studio. What led you to become an architect? Ever since I was twelve years old I was sure that I wanted to become an architect, even though nobody in my family had ever been involved in architecture. Once a house was built in the neighbourhood and as a small boy I watched every stage of the building process from start to finish. I was really fascinated by observing how a house is built, as well as its technical structure and complexity. After I had then worked as an architect for a few years the next logical step was to enter the house which I had designed and get closer and closer to the people living in it. This was then the start of my furniture design. It brought me ever closer to the dimensions of the human body and since that time I have even produced designs for smaller household objects such as knives and forks. What has struck me about the process is that it's in fact only the dimensions which are different. From the actual design point of view I haven't departed very far from architecture. Today you are concentrating exclusively on design. How did you come to establish your own design studio? At the beginning I built most of my designs myself. I was much too impatient to wait while they were built by a manufacturer. However, after some of my designs had been published and there was demand for my furniture I realised that series production was the answer. But when you make things on a professional basis your sales operations also have to be professional. And then finally you no longer have the time to design anything new. So then one day I thought: "Stop! I've simply got to take one step backwards and slowly begin to develop contacts with manufacturers". How long did it take you to reach the point when you were established and manufacturers came to you with orders? It took a few years. I've been working hard on this since 2001 and for two or three years now I can say that I can earn a good living from my work. Another point is that as a newly established studio you're happy that you can produce beautiful things and then see them on the market. You don't immediately think about the fact that you need to make money with them. Initially becoming known is enough recognition, but unfortunately it's not enough to live on. That was an important truth for me to learn. I had never worked for anyone else as a designer and I was still very inexperienced. Another important part of my activity is exhibition design, which I carry out on behalf of major companies like BASF and Boffi. With a small studio like mine it's not easy to live from designing furniture alone. The market is much too specialised. Too specialised in the sense of exclusive? Yes, my designs function mainly in small series, and the companies for which I work simply don't produce in large quantities. If you design specially for mass production that's a different story. In the last analysis designers live on royalties. But what is the reason for this? Does the large majority of people have no appreciation of design? Well, what you see in Halle 11 at the imm cologne – all this carefully designed furniture – these aren't of course mass-produced items. I don't know what percentage of purchasers really buy 'design', or what we understand by it. Does that mean that the products we see in the glittering showrooms represent a kind of prestige object? Many manufacturers live from the sale of furniture which is never even mentioned in the usual media, or they make a living from entirely different fields, such as equipping automobiles. Do you believe that Germany treats designers in a different way? I've worked in Italy, too, and there you are initially very much regarded as a foreigner. 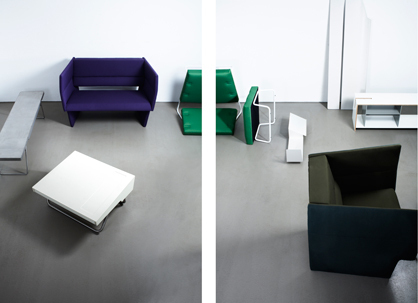 In Italy people prefer to employ Italian designers, which is the result of a longstanding tradition. In England things are similar. In Germany exactly the opposite is the case. Here foreign designers are regarded as exotic and they are somehow classed as chic. Are you planning to go back to architecture at any time? I haven't forgotten about architecture entirely. It has been a much too important part of my life. But I wouldn't want to have an architectural company any more, even if devising concepts, the design and then developing the detail would be highly enjoyable. One of the reasons why I turned my back on architecture for such a long time is that the whole working process simply takes too long. I must now admit that things are not much different in furniture design. You can easily spend two or three years working on a complex chair. Except that you are working on a scale which is easier to plan and to create as a model. Exactly. Architecture is something you can never do on your own. I simply don't want to carry such ballast in terms of responsibility around with me. This is also the reason why I have two collaborators at most; I don't want to have a ten-person studio. I would feel it was restricting me in what I really want to do. You've got too much responsibility for your staff and you're not in a position to decline an order because you don't like the briefing. And suddenly I would have to make compromises in my designs to keep everybody happy. Do you accompany your designs right up to the actual manufacturing stage? This varies, and it depends on the individual company. Manufacturers often have their own production methods and can only change these with difficulty. I now try to make my prototypes myself with the help of local craftsmen so that I can finalise as much as possible in advance. With such a prototype under your arm you are in a very different negotiating position. 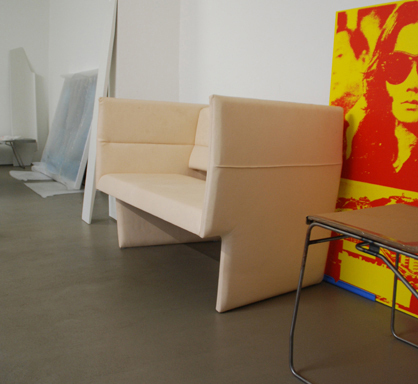 The prototype of the Cup sofa which was presented by Richard Lampert in Milan was something I completely built myself. You can work with much greater precision, and above all everything can be done so much faster. Which stage of the design process gives you the most problems? When do you find yourself struggling? This stage goes all the way from beginning to end. I'm not one of these fast designers. At least that's the impression I have myself. I often end up with the very first idea, even if I question it at great length and in depth. I then spend ages testing alternatives until I'm finally convinced that my first idea was the right one after all. I also don't submit any alternative designs. For me there is always only one solution for a specific briefing. To this extent design is often something like a fight. And from time to time it can take all your energy.